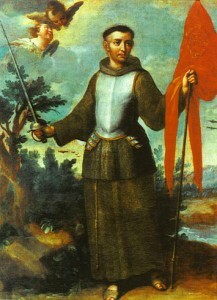 St. John was born at Capistrano, Italy, in 1385. His father had come to Naples under Louis of Anjou, hence he is supposed to have been of French blood, though some say he was of German origin. His father dying early, John owed his education to his mother. She had him at first instructed at home and then sent him to study law at Perugia, where he achieved great success. In 1412 he was appointed governor of Perugia by Ladislaus, King of Naples. As governor St. John set himself against civic corruption and bribery. War broke out in 1416 between Perugia and the Malatesta. John was sent as ambassador to propose peace but the Malatesta family had him cast into prison. It was during his time of imprisonment that he began to think more seriously about his soul. He decided eventually to give up the world and become a Franciscan Friar, owing to a dream he had in which he saw St. Francis and was urged by the saint to enter the Franciscan Order. John had married a wealthy lady of Perugia immediately before the war broke out, but as the marriage was not consummated he obtained a dispensation to enter religion, which he did 4 October, 1416. After he had taken his vows he came under the influence of St. Bernardino of Siena, who taught him theology. His apostolic life began in 1425, after he had received the priesthood. 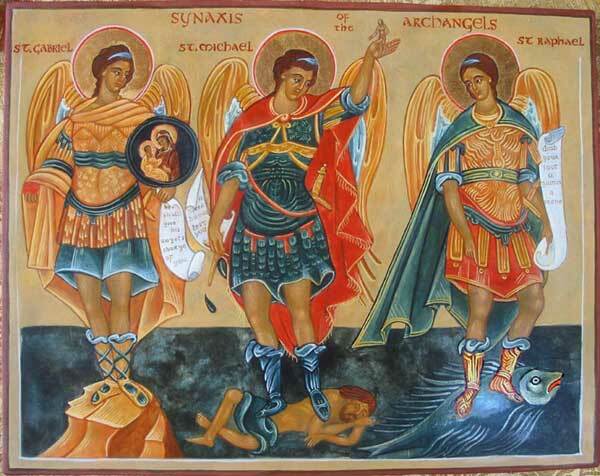 From this time until his death he labored ceaselessly for the salvation of souls. He traversed the whole of Italy; and so great were the crowds who came to listen to him that he often had to preach in the public squares. At Brescia on one occasion he preached to a crowd of one hundred and twenty-six thousand people, who had come from all the neighboring provinces. On another occasion during a mission, over two thousand sick people were brought to him that he might sign them with the sign of the Cross, so great was his fame as a healer of the sick. Like St. Bernardino of Siena he greatly propagated devotion to the Holy Name of Jesus. St. John was frequently employed on embassies by the Holy See. In 1454 he was summoned to the Diet at Frankfort, to assist that assembly in its deliberation concerning a crusade against the Turks for the relief of the Balkins: and here, too, he was the leading spirit. When the crusade was actually in operation John accompanied the famous John Hunyadi throughout the campaign: he was present at the battle of Belgrade, and led the left wing of the Christian army against the Turks. St. John died 23 October, 1456. In 1694 he was beatified, and in 1724 canonized. He wrote many books, chiefly against the heresies of his day. Oh crusader priest, you helped prevent the Saracens from overrunning Europe. Pray that we might prevent the pagans from overrunning all of Western Civilization. Sadly, now the left wing of the christian army is with the Turks. I’m afraid it’s more like the battle for Constantinople in 1453 than the Battle of Belgrade. I read about the horror of The Sack of Constantinople. Even the Sultan wept afterwards at the destruction. We in the West are just wallowing in our left wing Christian ignorance. Right now the same events are taking place and we’re just preoccupied with updating our definition of “Christian” to be more inclusive of paganism.